Essenza Living is a turnkey concept for the design and development of high quality, modern signature villas designed by reknown architect Carlos Lamas and managed by Essenza Living, together over 25 years of experience in contemporary architecture and real estate in Marbella. Essenza is an answer to the poor supply but growing demand of modern, international architecture in Marbella, we create properties that meet the risen, up-to-date standards of esthetic appeal, layout, quality, finish of materials and installations. It seems strange in today’s market, but finding these type of houses isn’t that easy, especially not in the most desirable locations, the consolidated areas in & around Marbella. We offer turnkey delivered villas ready to move in, or assist in the entire process from finding a suitable plot to design, comprehensive project management and key delivery. 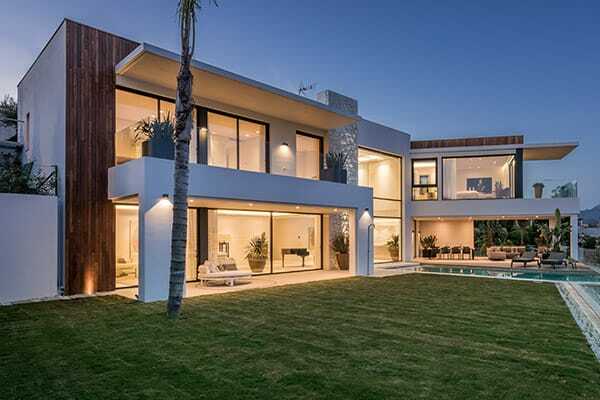 We are passionate about creating beautiful, high quality properties, redefining design and giving new direction to modern architecture in Marbella. Our Essenza villas have set new standards and is for contemporary architecture locally a benchmark. Many exciting new ideas & initiatives are in front of us, and these positive trends go hand in hand with Marbella’s revival of it’s property market. In a personal meeting we can elaborate more detailed information of services, with samples of cash flow reports, weekly building report, etc. We haven a proven track record of successful sales of our Essenza villas. Our experience in the real estate market and strong local & international network of professionals and selected agencies give us competitive edge in selling our villas at premium prices. Our project management service is comprehensive, we really add value, transparency, ease of communication to the process of development. Our team of technical architects assist in the correct definition and estimation of quantities to avoid early mistakes in quotations, we make a comparative analysis of the various quotes by selected builders (all complying with our set of strict conditions) and help with purchasing materials and installations by the suppliers at discounted costs. Through our local specialty stores for design furniture, fabrics, curtains, etc. we are able to provide complete interior design services. We have partnered will local and international interior designers for a tailor-made interior advice, being a showflat for commercial use, or a personalised to your own, personal taste and preferences. Stunning contemporary designed villa with spectacular panoramic views over the golf, sea and mountain scenery in one of the best plots of La Alqueria. Captivating contemporary new built villa in La Alqueria (Benahavis). This luxurious villa is designed by Carlos Lamas and is located on one of the best parts of La Alqueria, a quiet and peaceful location, offering breath-taking panoramic views to the golf course and lake, open mountain scenery and the Mediterranean. One of the most bespoken quality properties at the seaside of Marbella. The ground floor level consists of the living area and open plan kitchen area. The double high ceilings in the center part, with windows from floor to ceiling and glass front enhance the feeling of space and light. Since, 2013, we produce anually a high quality magazine of over 180 pages to present our portfolio of finished new villas and reforms, featured new, upcoming projects, and various interesting market articles. Also we showcase our 'preferred suppliers', our most valuable partners in the development and interior design of our ESSENZA villas. This selection covers builders, kitchen suppliers, domotic firms, landscaping, bathroom, interior design, etc. The magazine will further inhibit articles about the local market, architecture, 'trends' in the world of modern architecture & interior, a travel section, etc., We have 15.000 copies distributed locally in Marbella's finest addresses, and internationally through our partner companies. Are you considering to buy an existing villa to transform into a modern, up to date home, or consider a plot and do a new project? For sure you have many questions and need sound advise, prior to any decision or commitment. Please contact us for a meeting in our office as we may be able to assist you with the research, design and project management.